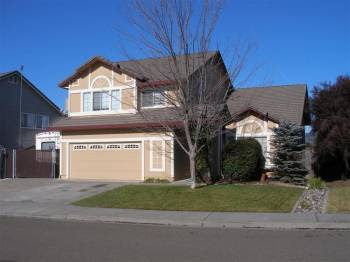 Jim Cheney has a featured listing up on a Windsor home located on Equity Court. It caught my eye not only for the ironic name of the street, but because it is listed for $399,000... nearly $100,000 less than what it sold for in 2003. When I started this website a year ago I viewed it as a way to address what I saw as a major problem: housing prices were still too high and first time buyers were getting bad advice from Realtors. This post by local agent Dave Roberts was emblematic of what I viewed as the problem (i.e. no presentation of the downside of home ownership, stating that despite the bubble a house was still “a sound basis for financial planning”, telling first time buyers they “are the heroes of our economic recovery”, a misconceived notion of bank capital, etc.). While I’ve had some cordial conversations with Realtors, for the most part the reaction to this site has been negative. That was to be expected. What I did not see coming was how first time buyers would generally react. I thought it would be a useful source of some facts/opinions regarding the risks of home ownership. But overall these facts/opinions have NOT been seen as a beneficial point of view to weigh when considering the purchase of a home. They’ve been viewed as an annoyance. People want to buy a home, they want to have someone tell them it is the smartest decision they are making in their lives, and they don’t want to hear about any downside risk. In hindsight it makes sense. You are about to take on a load of debt that is 4, 5, 6 times or more your income for a 30 year time frame. Buying your first car for a couple thousand dollars is stressful. Buying your first home for a couple hundred thousand dollars is all the more so. You don’t want to hear that all that debt you are taking on could be a huge mistake that could ruin your life. But this brings me back to the home on Equity Court. It’s an example of how the problem is not high home prices per se. The problem is too much debt. It was purchased in 2003 for $495,000 with a 1st of $396,000 and a 2nd of $49,500 giving them a 10% equity cushion. In 2004 it was refinanced for $522,000 with a 1st of $445,000 and a $77,000 2nd mortgage (i.e. $76,500 pulled out of the home). In 2005 it was refinanced again into a single $580,000 loan, thus taking out another $58,000. 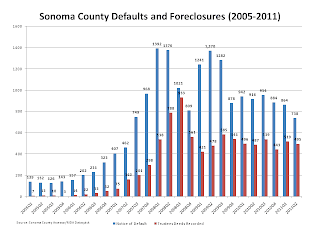 In 2006 it was refinanced again into a $564,000 1st mortgage, and a $44,550 2nd mortgage (i.e. another $28,550 pulled out). The home was put on the market last January for $495,000 and within 2 months it was lowered to $399,000. We’re still waiting for a sale. A Notice of Default was filed in August meaning in a normal foreclosure time frame it would have went to auction a few weeks back, however, a Notice of Trustee’s Sale has still not been filed. This is going to drag on for a while folks. The total loan balance on the home is $608,500 (not including negative amortization from non-payments). Now, I’m not judging how this money was spent for I have no way of knowing. Tragedies happen in life (divorces, deaths, diseases and medical bills) and possibly the money pulled out went to take care of problems like these. But $608,500 is a lot of debt. 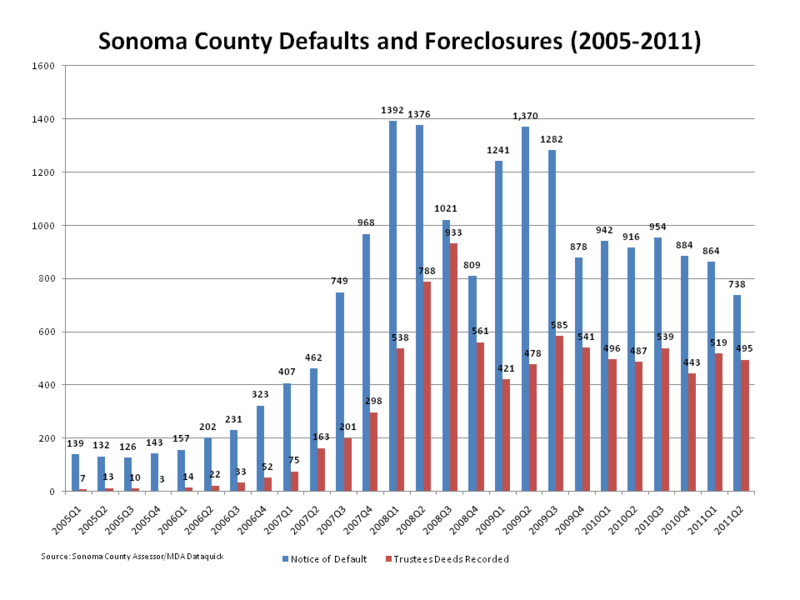 It looks to me as if this Countrywide loan was an adjustable rate mortgage due to reset in the summer of 2011. That’s still a year and a half before they would have to fully service the loan. 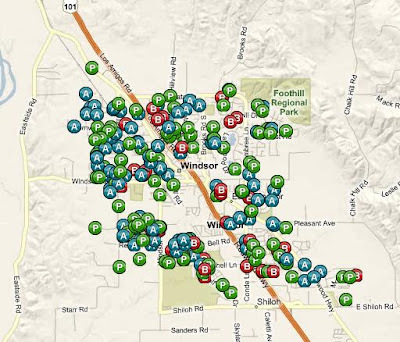 Again, using ForeclosureRadar you can see that there are a multitude of homes in similar situations. No doubt more will appear in the next 2 years as everyone’s interest rates reset. All this debt is not going away. Either people will struggle with this burden for a decade or they will default and a government that is already bankrupt will be picking up the bill. How that all ends I don’t know but you can bet that it means higher interest rates compounding the problem for everyone. Expect housing prices to fall for the foreseeable future. At any rate, I feel it is time to wind down this website. I’ve still got a few posts in the works that I want to put up (one in particular focuses on around 60 homes purchased for over a million dollars that are all severely underwater showing this crisis is far from over) and from time to time I’ll link to interesting news stories. But overall the website has served its purpose. I’m now one of the top rated real-estate websites in Sonoma County so anyone looking for information on the local market can find reasons why buying in Sonoma County in the immediate future might not be a good idea. Sadly, that’s the last bit of news most want to hear. A special thanks goes out to Patrick Killelea of Patrick.net (see a great recent interview with Patrick here). He really helped put this site on the map and has driven tens of thousands of readers to some of my posts. I also take some pride in the fact that the top three economic blogs on the web (Calculated Risk, The Big Picture, and Mish) have all linked to my articles as have news websites like the Wall Street Journal, Orange County Register, Washington Independent, Seeking Alpha, etc. Even real estate firm Redfin put a link to the site on their blog. A year ago I would not have thought all this was possible for a small local website with an anonymous author. Also the regulars in the comment section have really kept me going (Tom Stone, Lisa, Tyrone, Tom from Healdsburg, and others). Maybe we can keep the discussion going in the comment section of occasional posts. While the site is not completely dead, it will now begin its ride off into the sunset. Happy New Years and best of luck to everyone in 2010. Versions of the Credit Suisse reset graph have been featured in the Financial Times, used by the International Monetary Fund, and are a staple of web sites like these that are dedicated to the housing bubble. It’s fairly shocking then to see what appears to be a major error in their calculations. Last week (here and here) I noted that something didn’t make sense about Wells Fargo’s estimates that only one third of one percent of their Option-ARM loans would recast before 2012. Reader’s comments and an email from CalcualtedRisk helped me to get my head around what was going on. In fact, Wells Fargo’s numbers are technically correct. First for some background, when Wells Fargo purchased Wachovia it acquired about $120 billion of Option-ARM loans originated by a Northern California company called Golden West. 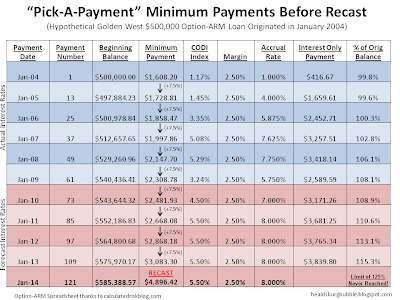 These Option-ARMs, or “Pick-A-Payment” loans, allowed borrowers to literally pick their monthly payment from four options: 1) a payment that would pay off the loan in 15 years, 2) a payment that would pay off the loan in 30 years, 3) a payment that only covered the interest, and 4) a minimum payment that was less than the interest only payment. In 2005, the initial monthly payment selected on almost all new loans was lower than the amount of interest due on the loans. For obvious reasons this has been of particular concern. If the amount one owes on a loan goes up while the value of the home is decreasing, there is a heightened risk the borrower might walk away from the home leaving the bank to deal with the loss. As the housing market has continued to deteriorate, the question on everyone’s mind is when will borrowers have to face the reality that they can't make a minimum payment forever? The Credit Suisse chart has been a guidepost for that reality check. But interest rate resets don't pose much a problem for those with Option-ARMs when rates are low. They can continue making a minimum payment that only adjusts upwards by 7.5% once a year. The real "payment shock" comes when the loan is recast (i.e. becomes fully amortizing over the remaining term of the loan). This occurs after a contractual time limit (normally 5 or 10 years) or, if due to negative amortization, the loan value increases to 110-125% of the original principal of the loan. Credit Suisse, an analyst told me, used resets in the chart for all loans except option adjustable-rate mortgages, when borrowers can choose a minimum payment that may be less than interest owed (option ARMs are in yellow on the chart… see how they are rising!). For option ARMs it used recasts, which can happen either when the loan amount expands to a maximum allowed — often 115% or 125% of original principal — or a set period, such as five years. Based on assumptions of a flat rate environment, if all eligible customers elect the minimum payment option 100% of the time and no balances prepay, we would expect the following balance of loans to recast based on reaching the principal cap: $4 million in the remaining three quarters of 2009, $9 million in 2010, $11 million in 2011 and $32 million in 2012... In addition, we would expect the following balance of ARM loans having a payment change based on the contractual terms of the loan to recast: $20 million in the remaining three quarters of 2009, $51 million in 2010, $70 million in 2011 and $128 million in 2012. In short, Wells expects $56 million in Option ARMs to recast due to the loan balance reaching 125% of the value of the original loan and another $269 million to recast based on the terms of the loan. Given that we’re talking about a portfolio of over $100 BILLION of these loans, this means ESSENTIALLY NO LOANS WILL RECAST due to the negative amortization limits or contractual terms before 2012. ...most of our loans are scheduled to have a payment change without respect to any annual limit in order to reamortize the loan over its remaining life at the end of the tenth year or when the loan balance reaches 125% of the original amount. We term this reamortization a “recast.” Historically, most loans in our portfolio have paid off before the loan’s payment is recast. History doesn’t look like it will be a good guide going forward but this at least clearly spells out what we are facing. If recasts don’t happen contractually for 10 years this means that the $49 billion of Golden West Option ARMs originated in 2004 will recast in 2014, and the $51 billion originated in 2005 will recast in 2015. But take a look at the chart. 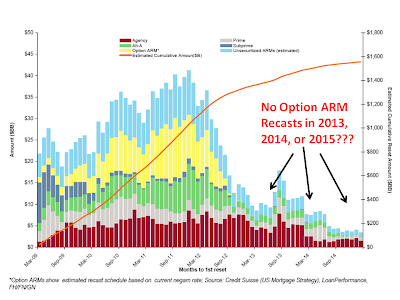 Credit Suisse shows NOT A SINGLE OPTION-ARM RECAST IN 2014 (nor any in 2013 or the first three months of 2015). Maybe Credit Suisse moved the recasts up based on the loans hitting their 125% balance caps as they state in their footnote? But again, the numbers don’t add up to what Wells states in their last 10-Q: virtually no recasts due to "reaching the principal cap" before 2012. Here we look at a hypothetical $500,000 Option-ARM mortgage originated by Golden West in January 2004 that now sits on Wells Fargo’s books. In order for the loan to recast before 2014 it needs to have enough negative amortization to hit the 125% limit. Wells Fargo assumes a "flat rate" environment in their calculations, but I assumed that today the CODI index (used for a majority of Golden West loans) plus margin jumps to 7% from its current level of 4.875%. At the end of the year I assume it jumps another 100 basis points to 8% and stays there until 2014. In short, the Credit Suisse chart above looks to be incorrect. Contractually, these recasts won’t happen until 2014 and given the generous 125% cap it is unlikely negative amortization makes these loans hit that limit unless we have a major spike in interest rates. As mind boggling as it may seem, recasts for Wells Fargo’s giant Option-ARM portfolio won’t take place for another 5 years. Also worrisome is that we’ve heard from readers that WaMu/JP Morgan is notifying Option-ARM borrowers that they are extending their minimum payments out another 5 years. Are they pushing off recasts into 2014/15 as well? The bottom line something doens't add up when Wells Fargo predicts virtually no Option-ARM recasts before 2012, while Credit Suisse predicts no recasts after 2012. While I would guess Wells Fargo is underestimating recasts assuming a flat rate environment, the bulk of recasts do look like they will be pushed out to 2014/2015. Surely, some of these recasts need to be reflected in the Credit Suisse chart. I’ll leave it to others what this means for the housing market, but what is clear is this needs more attention. A 125% cap on the loan balance applies to loans with original loan-to-value ratios at or below 85%, which includes almost all of the loans we originate. Loans with original loan-to-values above 85% have a 110% cap.